Thierry Koskas (right) talking to Renault managing director and team principal Cyril Abiteboul. 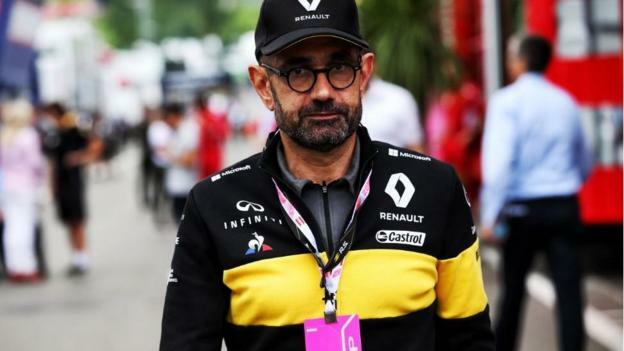 Renault has appointed Thierry Koskas as the head of its Formula 1 programme. Frenchman Koskas will replace Renault Sport president Jerome Stoll on 1 January, as the team seeks to close the gap on Mercedes, Ferrari and Red Bull. Koskas will report directly to Renault chairman Carlos Ghosn and oversee managing director Cyril Abiteboul. Renault says its target is to ensure the team can “race with the best and contest the title” by 2021. Koskas’ appointment comes at a time when many senior figures in F1 believe Renault faces existential questions about its participation in the sport. It is currently spending about 60-70% of the budgets of world champions Mercedes and their closest competitors Ferrari and Red Bull. And while Renault will finish the 2019 season best of the rest in fourth place, its car has been on average nearly 1.7 seconds a lap slower, and at times has been lapped by the Red Bulls, which this year use the same Renault engine as the factory team. Ghosn was initially sold on the idea of Renault owning its own team again on the basis of spending no more money than its current budget. F1 bosses are in the midst of talks with the teams aimed at introducing cost control and a budget cap, but that is unlikely to be in operation on any significant level in time for 2021. Renault could therefore face the difficult choice of either accepting it is unlikely to catch the top three teams at its current level of spending, increasing its budget to a level it did not initially want to, or waiting for the the cost-control measures to kick in and accepting that it might take longer to achieve its targets.